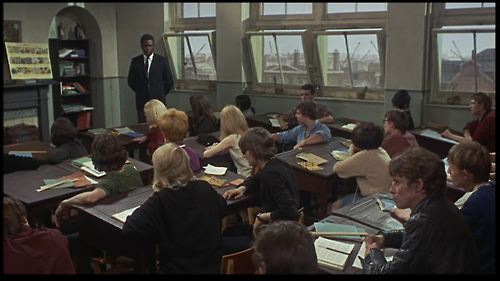 Mark Thackeray (Sidney Poitier) is an out of work engineer who decides to take a job as a teacher at an East End school full of rough-and-tumble London kids. Mark’s new colleagues warn him about the class. Other teachers have been driven away! The kids are terrible and like to take over the halls for dance parties between classes! Still, Mark sticks with his new job, entering the classroom completely unprepared but ready to take on every challenge. What he finds is a room full of typical teen angst, exaggerated by the perils of living in poverty. 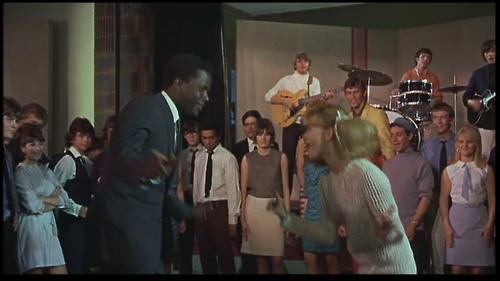 Students include Denham (Christian Roberts), a tough guy who thinks just about everyone around him is worthy of a beating, and Pamela Dare (Judy Geeson), who is a bit brash but readily accepts Mark as a respected figure and is willing to learn from him (partially because she has a crush on him). Mark takes on the class bravely and forcefully, taming them and teaching them to respect both themselves and each other. To them, he becomes known as “Sir” – that great teacher everyone hopes for, who changes their lives and attitudes in ways that they never expected the first day he walked into the classroom. 1967’s To Sir, With Love is based on E.R. Braithwaite’s autobiographical novel and directed by James Clavell, who was nominated for a Directors Guild award for his efforts here. The film was remade for television in 1974 and followed by a 1996 sequel, To Sir, With Love II, which is set thirty years after the original. First off, let’s talk about the students. Compared to some of today’s teen’s they’re relatively tame even before Thackeray’s influence changes them… but that doesn’t mean they’re likable. I usually write my reviews from a general viewer’s perspective, but I feel the need to include some of my own personal experience here: these are the kind of students that I hated having class with in high school. The film seems to blame this behavior on their social class (which is my one major qualm with the story, having grown up on the lower end of the wealth spectrum myself), but speaking from personal experience, I can tell you that this type of behavior definitely crosses the class boundaries.The clothing styles and specific rebellious actions may have changed over the years, but the struggles that these students face in relating to the world (as well as their general attitudes) are still relevant. A law-abiding student by all accounts (and definitely what one may call a “geek”), I always had (and still have, in my university classes) a very low tolerance for the disrespectful and disruptive. The audience does grow to like some of the students more as the story moves along and they show growth. They still have their moments, but growing up is a long and slow process, so this is understandable and makes the characters feel very natural. No viewer should expect them to transform into perfect citizens overnight. 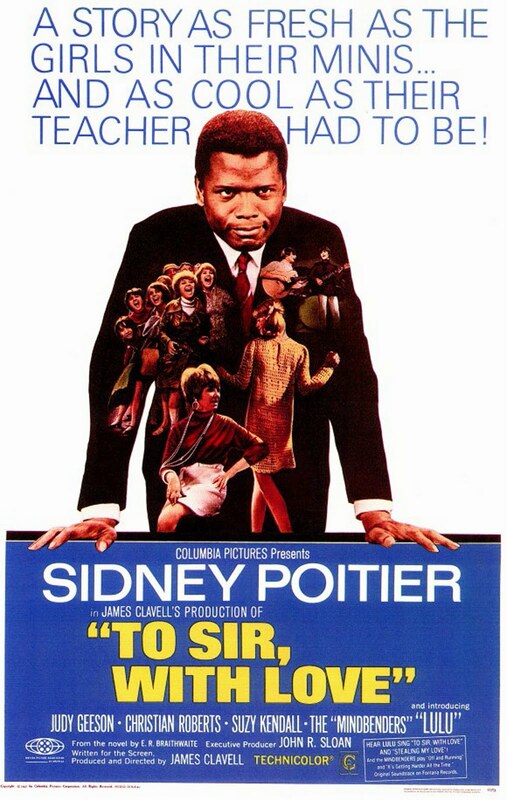 Though the actors filling the student roles do a great job here and many of them went on to find success in the entertainment industry, To Sir, With Love belongs 100% to Sidney Poitier. His character of Mark Thackeray, or “Sir,” is many things: steadfast, determined, calm and collected (but not always completely likable by modern audiences due to his open use of brash language when he is trying to get the point across to his students, and the female students in particular). Despite his flaws and inexperience, though, Thackeray is wise and always has an answer for his students, proving that great knowledge doesn’t always come from expected sources. Poitier gives a very strong but definitely understated performance in this role. There could be no other sufficient choice as the lead for this film – he carries it flawlessly. The film as a whole tackles a number of issues: race relations, poverty, growing up, generational gaps and gender roles. There are some fun and funny moments, such as a mid-film field trip montage (featuring the film’s great title song) and a bit of highly amusing Awkward Poitier Dancing, but overall the mood is serious. The result is a film that can be a bit sentimental at times, but in such a way that it comes off as a film with heart rather than a complete cheesefest. A thoughtful review. I agree that the students are quite disagreeable at first, even though their actions are tame by today’s standards.Some are still unlikable at the end of the movie! And Poitier is perfect – I can’t imagine anyone else in this role.